Printed on 14pt Dull Matte Card Stock. 14pt Dull Matte Greeting Cards: Take the greeting card tradition to the next level with our 14pt Matte Greeting Cards. Generic greeting cards can seem so impersonal, but these custom greeting cards will have your personal touch. Customize your card with our online design tools and choose from a variety of holidays and categories. 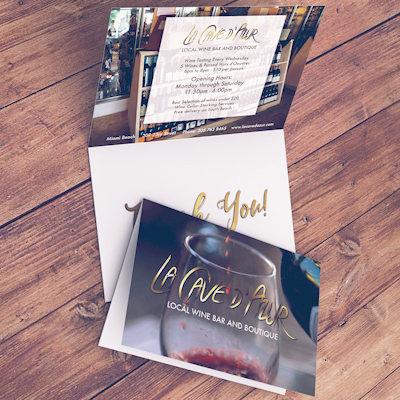 Once your design is complete and customized to your satisfaction, we print your design in full, vivid color on quality 14pt Matte card stock. Our 14pt Matte Greeting Cards are available in a variety of sizes in full color on one or two sides. Folding score included for easy folding. Job will be delivered flat and unfolded.